If you find yourself searching for a reliable help desk solution for your company you’ve most likely considered Salesforce as one of the options. To help you choose the most suitable software for your business our team of experts prepared a thorough analysis of Salesforce pros and cons. With our assistance you should be able to make an informed decision before you decide to invest in a particular app. To offer you a more meaningful perspective on the quality of Saleforce we also compared it with Freshdesk, one of the leaders in the help desk software market. If you’re interested in testing Freshdesk on your own you can easily do that with a great Freshdesk free trial they offer. For a better overview of all help desk options available on the market you may also want to read our comparison of top help desk software in 2019. In our detailed review, Salesforce received a high score. Here is our list of best help desk solutions in 2019. The Salesforce platform has capabilities that offer sales management, customer service, marketing automation, and partner relationship management. Salesforce is a full-featured helpdesk software. If you are a small business, you can easily take advantage of the capabilities the tool has to offer with select pricing plans designed for small businesses. As an all-in-one solution, Salesforce offers businesses everything they need to find and retain customers, close transactions and grow your business. As a cloud-based CRM solution, Salesforce gives you anywhere, anytime, access to your business data, even from mobile devices. Salesforce Sales Cloud is generally all about streamlining the work sales process to help companies close sales easily and quickly. Everything can be done in a very automated and efficient manner, and the software solution is created to give you the information you need in order to manage contacts, turn prospects into customers, find leads, run more effective marketing campaigns, among others. Salesforce has a good contact management system that allows you to do more than just a usual address book. Aside from storing phone details, addresses, as well as other contact information, Salesforce keeps other crucial data to provide you with a 360-degree view of each client. Salesforce allows you to efficiently manage opportunities and easily close sales using built-in deal evaluation and quoting tools. In just some clicks, your helpdesk can create PDF quotes that can easily populate pertinent data, such as customer information, pricing, quantities, delivery information, payment terms, and more. From the platform, you can email the details to the customer directly. The solution can likewise show you the value of every deal as well as its current status. You can also track activities and receive alerts as business accounts go through the sales process. Customizable dashboard. When you log in, the tool’s dashboard gives you a huge range of report widgets, allowing you to have a bird’s-eye perspective of how your company is performing. Your sales reps can check out real-time summaries of customer data and other relevant statistics. Easy-to-navigate software. The software is also easy to navigate. A simple navigation bar exists at the top of the window. The tabs are separated into various categories, such as Home, Accounts, Contacts, Leads, Opportunities, Campaigns, Forecasts Files, among others. Social capabilities. The tool’s social media function and news feed operate very much like Facebook, thus making it very familiar as well as easy to use for users. You can quickly browse the news feed and immediately post status updates, share links, and upload files right from the dashboard. Complexity. For small businesses, Salesforce’s greatest strength is also its weakness. Since it is such a robust solution, it is a good choice for many growing small businesses. However, the tool may be overwhelming for those with microbusinesses that do not really need such a complex software solution. This is especially the case for small companies that may not have a dedicated sales staff or already possess their special lead-generation and sales solutions that perfectly work for them. Pricing. For some small businesses, pricing may also be an issue. Although the helpdesk solution offers affordable prices even for small businesses, the problem may happen when it comes customizing the software and if you prefer using third-party solutions. In addition, if you or your agents lack the basic skills to customize or implement the helpdesk solution, there are add-on costs for your business so you can hire developers who will tinker the system for you. Small business owners claim information technology costs can reach up to hundreds of dollars, even tens of thousands of dollars, from those who are skilled enough to help them with the helpdesk software program. Uncontrolled administration. Users also complain that Salesforce can turn your work environment into a nightmare because its administration features can be uncontrolled. Problematic technical support. Businesses also complain that the helpdesk solution offers problematic technical support, especially the tool’s sales reps change from time to time easily. Tricky reporting. When you use Salesforce, sometimes reporting even just basic information can be very tricky. Generating reports, compared with the rest of the helpdesk solution’s features, is not as user friendly. 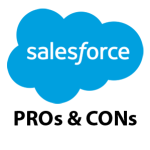 If you’d like to get more information about Salesforce’s offer, features and available integrations you can read our detailed review of Salesforce. Our team of B2B experts prepared a detailed analysis of all significant help desk solutions on the market and in our study Freshdesk quickly became a leader in our list of best help desk solutions in 2019. Freshdesk provides a wide range of flexible pricing plans to satisfy the business needs of various companies and industries. It’s actually possible to use Freshdesk for free if you have a small team of up to 3 agents, and for more advanced plans you can always use their free trial to try out the app first and see if it will work for your company. You can sign up for Freshdesk free trial here. Freshdesk really stands out from the rest of the solutions, thanks to unusual key features. This may sound clichéd, but this tool really brings something new and groundbreaking in the helpdesk system industry. It integrates with Google Apps, among other applications. Therefore, you can quickly login to the tool using your Google account. Freshdesk, simply, is not like any other helpdesk solution on the market. First, Freshdesk bills itself as a “Social Helpdesk”. This feature is not only trendy at the moment, but it is really very convenient, from the standpoint of your customers and helpdesk support agents. Freshdesk allows Facebook wall posts and comments as well as Twitter mentions and direct messages converted into tickets. Since almost every Internet user has Twitter or Facebook account (most have both), a business can quickly have their customers send their trouble tickets o concerns right from their Twitter or Facebook account. At the same time, helpdesk support agents can quickly handle those trouble tickets and have replies immediately posted on Twitter or Facebook, without much difficulty or the need to get third-party social media platform involved. Suitable for any business. Freshdesk would be perfect for any company that has a helpdesk support team that taps email or social media to help users. Freshdesk is highly flexible. Once your company is able find your way around the tool, Freshdesk can be a crucial element in your online business presence. Simple to use. Freshdesk is relatively simple to use. Even if you are a novice when it comes to helpdesk software, you would not have a hard time using the features of Freshdesk. In addition, you do not need any technical or information technology support to help you understand the tool. This means, more savings for your company. In addition, your company will save time when it comes to training your helpdesk staff in adopting the software solution. Quick integration. The helpdesk software solution can easily integrate with nearly 60 other applications. For companies, this is a very outstanding feature particularly if they want a helpdesk solution can be quickly integrated with other applications you are using in your business. A little more expensive. The plans offered by Freshdesk may be a bit more expensive compared with other helpdesk solutions available in the market. To be fair however, every cent is worth it when you use a Freshdesk account. You almost certainly get what you spend for in a helpdesk solution. After a detailed comparison of Salesforce, Freshdesk and other top help desk solutions our review panel decided that at the moment Freshdesk would be the best option suggested for your company. Freshdesk is a very effective and reliable software that should meet all the needs of your business. It also offers a very flexible pricing plan that you can adjust to your requirements and if you have a small team of up to 3 agents you can actually use Freshdesk for free. All plans can be easily tried out with a great free trial that will give you an overview of all key features of the app. You can get Freshdesk free trial here.